Convoluted double hump anechoic wedges. SONEX™ patterns also available. Designed for sound absorption in a wide range of frequencies. 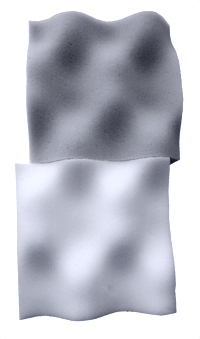 Increased surface absorption area. Industrial, Commercial, Audio, OEM Residential Markets, Ceilings, Walls, Partitions, Sound/Recording Studios, Radio Stations, Board Rooms, Swimming Pools, Churches, Schools, Gun Ranges, Enclosures. ASTM E84, Class A. Flame Spread: 6; Smoke Developed: 15.